Deadpool 2 has started filming and that means it’s time for star Ryan Reynolds to start sharing set pictures for all of us to see. 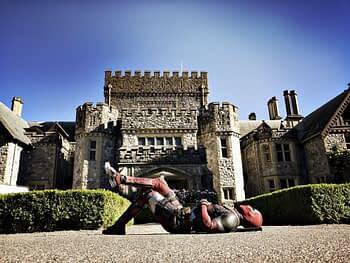 He shared a picture of himself at the X mansion a few weeks ago but Reynolds took to facebook today to show the clapboard for Deadpool 2 and a look at what could be the logo. Unfortunately we still don’t know anything about this movie but there are some set photos out there. Reynolds did a great job of getting people excited for the first movie through social media. The logo likely won’t be the final one but the heart made of hands symbol on the far left side is a cool little touch.